By 2045, 80% of the world’s population is expected to be living in urban areas and currently 1 billion urban poor are residing in informal settlements. Alexandra Township (Alex) in Johannesburg, South Africa was established in 1912 for a white residential township, but it was far from the center of Johannesburg and was not a success. Prior to the 1913 Land Act, this was one of the few urban places black people were allowed to own land. Alexandra is located close to the wealthy areas of Sandton and Wyberg, while Alex is one of the poorest urban areas in the country. Home to a fluctuating population of 350,000 to 700,000 people in a 2 square mile area, Alex is characterized by the resident’s struggle for the right to remain in the city. Throughout the years there have been many removal schemes in place to remove the “black spots” from the city. By the 70’s there was not much formal housing, therefore people were forced to live in backyard shacks, pavements, river banks, and squatter camps. In 1994 the African Nation Congress took control and their main agenda has been to deal with the socioeconomic problems brought about by the apartheid. The current constitution states that “everyone has the right to have access to adequate housing” and the “state must take reasonable legislative and other measures within its available resources, to achieve the progressive realization of this right.” To reach this goal the ANC created the Reconstruction and Development Program (RDP) to build and allocate houses. Although the RDP on paper sounds like a positive impact to the people, it seems to have caused more harm than good. Roughly 43% of households in Gauteng have at least one person on a wait list for an RDP home and there is an ever growing backlog of 2.1 million people waiting for homes. The Reconstruction and Development system in Alexandra needs reform, strictly focusing efforts on building homes does not lift people from poverty. They are desperately in need to a more holistic approach to housing, infrastructure, and community relationships. The question that lies ahead is where are people living instead of their non-existent RDP homes? Interviews with community members have shown that residents of Alex are living in backyard shacks of RDP houses, which has proven to be a very positive, co-dependent relationship. Too many of the owners, backyard dwellings are a very important source of income and for the tenants these accommodations offer improved living conditions and security. Backyard shacks paired with suitable infrastructure could be a solution to keep the density of the rest of Alexandra and diversify RDP housing. Currently the problem lies within the fact that RDP homes replace existing shacks at a much lower density and efficiency then what is necessary in Alexandra. The government of Johannesburg has already made recommendations for Alexandra to have a density of 75-200 dwellings per 100,000 square feet. These recommendations do not align with the current RDP model. They infill below 75 dwellings per 100,000 square feet and needs to be updated to reflect the city needs. Concurrently, large scale infrastructure in Alexandra has been unsuccessful and the shack infill only complicates the situation, there are many sewerage backups, electric blackouts and not enough water pressure or running water. A more effective government housing strategy focused on user participation, flexibility, and micro-grids may receiver greater user satisfaction, control infrastructure challenges, as well as urban density. Only about 20% of the informal housing in Alexandra is recognized; the government is not looking at the informality between the formal housing. 85% of people living in Alexandra make less than 3,200 rand per month ($274), therefore contributing to not being able to afford their RDP homes and the expenses that result. Because much of this housing is informal, they do not have access to basic services. 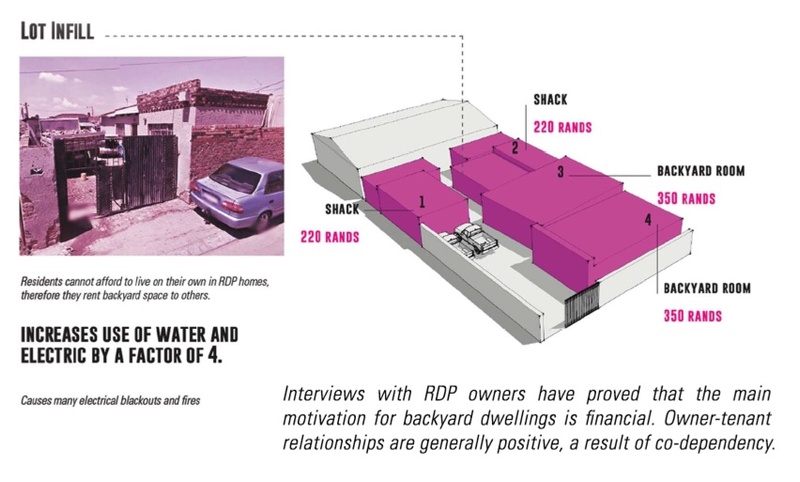 The average RDP home has a lot size of 80m2 and an average house size of 36m2 therefore the land is used very inefficiently and infilled with backyard shacks. These renters living in the backyard dwelling help the homeowner to pay for electric and water bills (84 – 200 rand per month or $5.8 -$14) as well as other expenses that come with living in a home rather than a shack. 51% of people living in shacks have access to trash removal, 5% have access to basic sanitation, 66% have access to basic running water, and 27% have access to electric in their dwellings. These numbers further establish that people do not only need a place to live in they need a new system to give them basic infrastructure. The goal is to create a more effective and community based public housing strategy which first provides basic infrastructure through a system of micro-grids, while maintaining density in Alexandra. Reallocation of the existing RDP funding is the first step in the process. Instead of using RDP funding to build houses for people, the money should be used to set up long lasting infrastructure systems for the people of Alexandra to promote formality. By providing residents with basic infrastructure it allows them a way out of the poverty cycle as well as brings growth and formality to a very informal situation. To address the issue of housing a new incremental methodology will be employed. A system of “wet blocks” and “dry walls” will construct the basis for new RPD dwellings in Alex. The module consists of four homes defined by three SIP panel walls with electric and one bathroom/kitchen block per home. The SIP panel modular components are able to be used in different combinations to create varying lengths and patterns. Each home will be provided with a private bathroom/kitchen block, which houses and tub, toilet, sink, laundry sink, and solar hot water tank. The opposite side of the bathroom module will be a small kitchen with essential appliances. In this incremental housing scheme the rest of the house is left up to the owner who receives it. They are able to connect to the module with any construction type they can afford as well as expand or upgrade when necessary. On a larger community scale homes are arranged to allow for as much outdoor space as there is indoor space. Each resident is allotted and 8’ x 28’ garden space and between every 16 homes there is a large interior courtyard. This new system of housing infills at a density of 120 homes per 100,000 square feet, not displacing any existing shack infill. Urban density is a problem that we need to plan for in the future because it is already happening. Our solutions need to be able to expand for future generations and keep up with expanding growth rates. Therefore if the infrastructure is up to par with the influx of people entering cities, we can build and expand on homes as necessary. To further develop the proposal, the next steps would be to develop a manual for people in these urban centers, such as Alexandra to explain how these panels go together and suggestions for how to connect to them. Detailed connections for brick, metal, wood, and more SIP panels are created and then given to every new owner. This will aid in the process of rebuilding homes after these new structures are built. The final step would be to organize a plan to ensure that housing densities do not rise above 75% and that public spaces are used for social activities and not more housing. The intent is to understand growing urban centers and design an effective, yet personalized solution that addressed housing as well as infrastructure. The prototype that was developed based on the thesis achieved user participation, through residents building the remainder of their homes, with the materials that they wish to build it with. Flexibility is designed into the system using the SIP panels because they can be arranged in many different configurations. Each “wet block” creates its own micro-grid of bathrooms and kitchens that will be able to regulate supply and demand, therefore not causing overloads. This incremental housing solution for Alex prepares for the future by implementing a plan for infrastructure more so than building homes. Lauren Brosius is a recent graduate of Philadelphia University and holds a Bachelors of Architecture and a Minor in Landscape Architecture. During her time at Philadelphia University, Lauren studied abroad in Copenhagen, Denmark and has traveled around the world extensively since then. She is currently an Intern Architect at EwingCole’s Philadelphia Office, on their education team, where she works primarily in schematic design and design development. Lauren is actively working towards her architecture registration by working on her IDP hours. Lauren excels when being challenged in the creative design process, where she possesses prominent visual skills. Lauren looks at every experience as a way to grow, to learn more about architecture and its effect on life and the world around us.